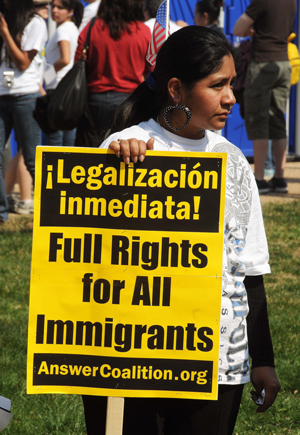 April 10: Demand full rights for all undocumented immigrants! On Wednesday, April 10, a major protest for immigrant rights will take place in Washington, D.C. The ANSWER Coalition is supporting this mobilization and issued the following statement. Full Rights and Legalization for All! Access to Citizenship for 11 Million! Immigration reform is long overdue. Congress is now reviewing reform proposals while Immigration and Customs Enforcement continues to detain and deport immigrants all over the country. With funding for detaining an average of 34,000 adult immigrants a day – not including detained immigrant kids – ICE terror has not stopped. Increased pressure for immigration reform has not brought the continued racist attacks from the right wing to an end. They threaten access to citizenship, and resources for immigrant women and family unity, and are scapegoating immigrant workers for the economic crimes of the banks. We won’t wait for a compromise – we demand full rights for all immigrants now! Full rights include access to citizenship, without penalties, fines or excessive waits. We demand an end to the attack on the right for immigrants to reunify with their families – and we demand greater family unity, including the ability to travel and see loved ones. ICE works hand in hand with the racist criminal justice system, using mandatory detention laws and the “Secure Communities” program to jail and deport thousands. ICE has admitted that closer work with border patrol has contributed to detaining more and more immigrants. Meanwhile, immigrant children are still fighting to receive an education, including access to in-statue tuition. Immigrant workers are still abused and stolen from by bosses, and threatened for trying to organize. Women still struggle against violence related to immigration papers. LGBT immigrants are especially excluded from legal protections. This second class “citizenship” must once and for all be put to an end. On April 10, immigrants and activists from all over the country are taking to the streets for a rally in Washington, D.C. Immigrant rights organizations and labor unions are mobilizing with thousands of people nationwide to descend on the West Lawn of the Capitol. A united movement of millions of working people and families can win the justice that we deserve. The event is sponsored by CASA de Maryland, SEIU 32bj, SEIU International, National Education Association (NEA), United Auto Workers (UAW), Communications Workers of America (CWA), Alliance for Citizenship and United Food and Commercial Workers (UFCW), and supported by many others. The official website is https://citizenship-now.squarespace.com/. The official hashtags are #A10 and #TimeIsNow.